Where I live, we may have in no uncertain terms, officially reached the Dog Days of Summer some steamy afternoon during the last couple of weeks. But the garden is mightily loving the heat. I was out of town for 6 days, and came back to huge changes – a few dozen Japanese eggplants popping forth from the plants, (I’m excited for these! Great recipes to come!) a golf ball sized spaghetti squash now football size, zucchini, wax beans, chubby broccoli side shoots, tasseling-out corn and a fresh optimism the garden will be producing well after all. 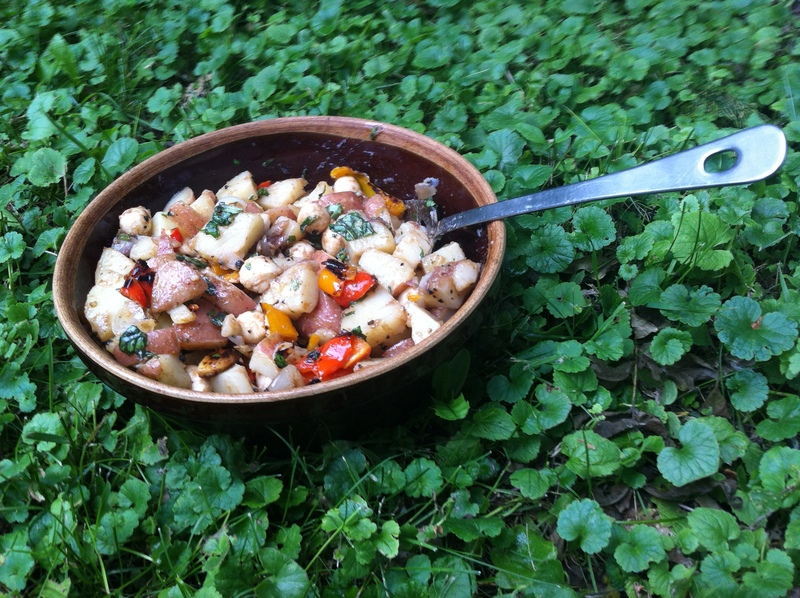 This unique potato salad was a delicious feature at a couple of recent meals, including Fourth of July with family, then again visiting friends in Boulder, Colorado – and is perfect for your next family get together. 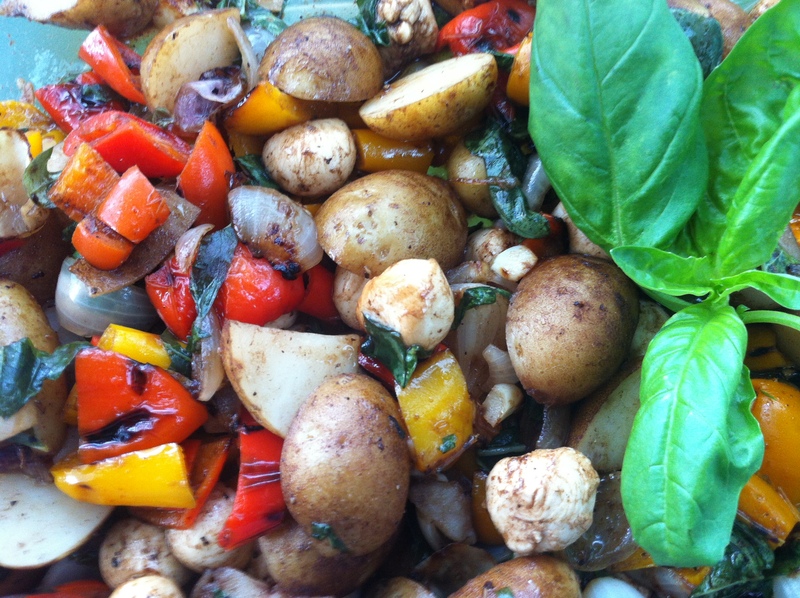 It’s a scrumptious blend of new potatoes, roast tri-color sweet bell peppers, onion and garlic — with fresh “pearl” mozzarella and chopped fresh basil tossed in a simple balsamic olive oil vinaigrette. two good sized handfuls of sweet baby bell peppers (I love the red, yellow and orange mix!) Large peppers work excellently too! If necessary for size, halve or quarter the new potatoes. Steam or boil until quite tender, drain, and place in large bowl. Meanwhile, clean and halve or quarter onions, stem, halve and seed peppers, clean garlic cloves and leave whole. Grill onions, peppers and garlic, cool slightly, and roughly chop as desired. Add to the potatoes, along with pearl mozzarella. Roughly chop basil and add in to the bowl. In a separate small bowl, whisk balsamic vinegar while drizzling olive oil in. Add pepper and salt, and a bit of mustard if desired. Pour over salad and stir to blend. 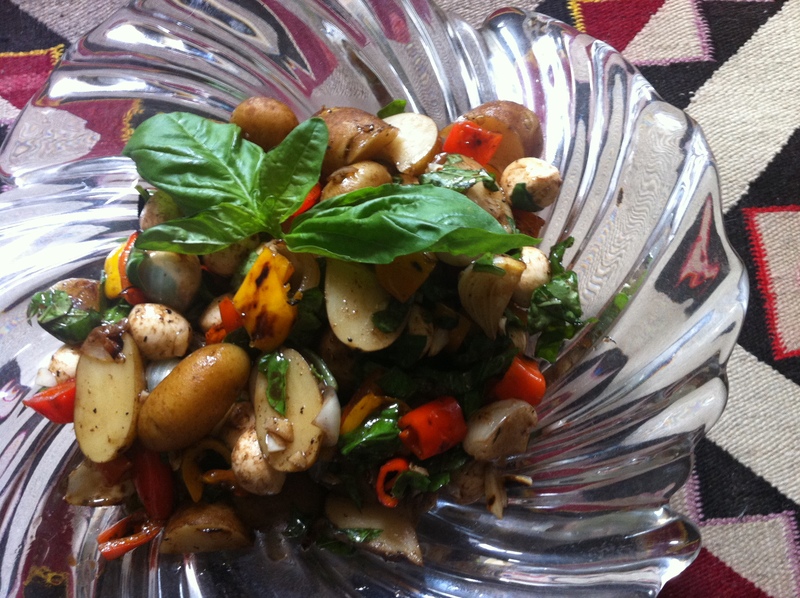 Delightful while still warm, as the mozzarella softens and the roast peppers are at peak flavor. Delicious refrigerated overnight as well. Lovely for picnics or outdoor dining as outdoor temperatures do not quickly spoil the salad. This salad is absolutely wonderful! You’ve just got to try it. Oh it is….! Thank you, GFF! I hope you try it – my favorite way is warm. Where can I buy pearl onions and how on earth would one go about grilling them? Thanks for stopping by my blog, Lynn! I find the pearl onions(or boiler) as they are sometimes called, along with other onions in good sized supermarkets. If you can’t find them, just use red or yellow onions, halved and cut into around six pieces (per half.) You could use a grill basket (metal bowl with holes in it) if you have one, or a stove top grill pan, too. Hope this helps! Let me know how it turns out!